A vending machine at Tokyo's Akihabara station is now offering a limited run of canned bishoujo bread in celebration of the new Clannad TV anime series that begins October 4. Clannad, which was first released as an interactive love adventure game (visual novel) for the PC in April 2004, follows the adventures of a high school delinquent as he develops relationships with some of his female classmates. 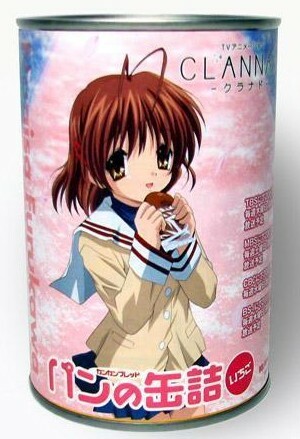 The 350-yen ($3) canned Clannad treats -- available in chocolate, strawberry, green tea, butter, raisin, blueberry, and milk -- are manufactured and distributed by Pan Akimoto, who originally developed canned bread as an emergency food in the aftermath of the 1995 Kobe earthquake. In Akihabara, where cuisine like canned oden enjoys widespread popularity, the future of canned bishoujo bread looks bright. A vending machine on platform 6 (for Sobu line trains bound for Chiba) will be dispensing the canned bread until the end of October. What in the bloody hell is this!? You humans... sometimes I wonder about you! And here I thought I have seen everything! Bah, guess being over 1,000 years old and having gone through 11 regenerations doesn't really mean much of anything anymore. Squidward Tentacles would be so happy (season 2, episode 26B of the "SpongeBob Squarepants" TV series). [Gerrymon]’s Digivolution Blog » Blog Archive » Its that Seasons again~!